There have been many times at restaurants where due to lack of a better option, I was left ordering the veggie burger. I say this in a disappointed tone because of some seriously bad experiences. Chunks of corn, dryness or weird seasonings are just some of the many points I have on my veggie burger sh*t list. Ultimately it has been the taste of freezer burn that has really turned me off from the patty all together. 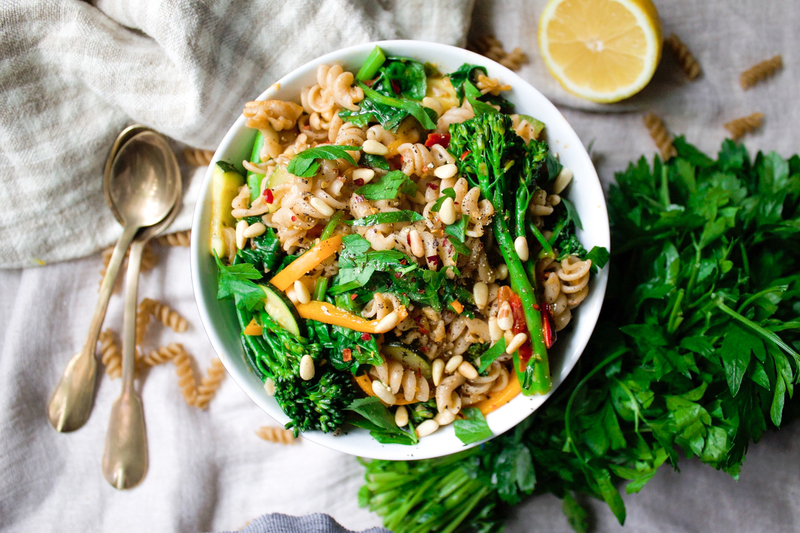 And if you are think you are doing your body good by having that veggie burger… most of the time those few veggies hidden in that burger are coated in white flour and butter. Often, it might even be better to just have that ol’ hamburger if you truly enjoy that more! This isn’t my first time making veggie burgers. I have done it before by following a few recipes that were… ok. Some recipes actually required so much work that by the time the patties were finished, I was too tired to even make them. So this week I hit my kitchen to create my own veggie burger with flavours that I love! The result was a tasty, nutritious and easy to make patty that I’ll be making time and again. 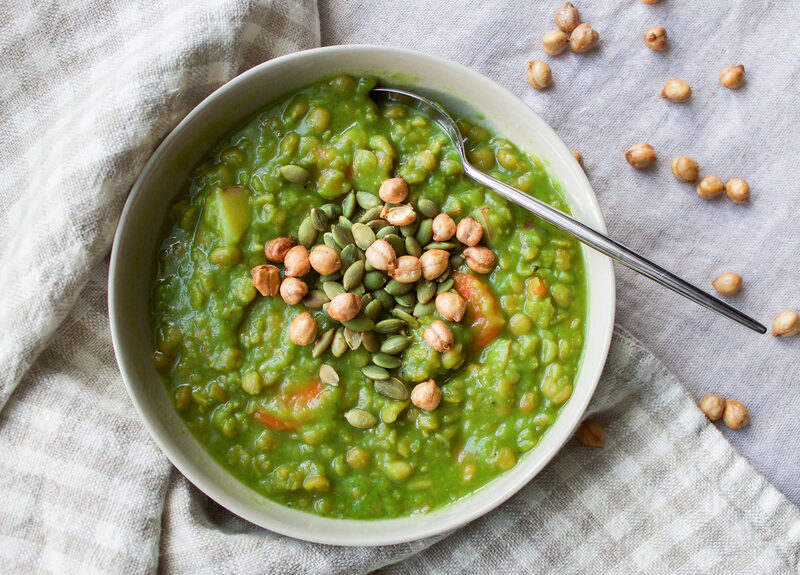 Sweet potatoes, lentils, sunflower seeds and brown rice add protein, fiber, healthy fats and a whole load of vitamins leaving you satisfied and glowing! The sweet potato will leave this burger more on the softer side so I don’t recommend eating these with a bun. Plus, you really have all the carbohydrates you need from the patty alone. Pairing it with a crunchy lettuce wrap or in my case cabbage cup, is the perfect contrast to the soft texture of the burger. 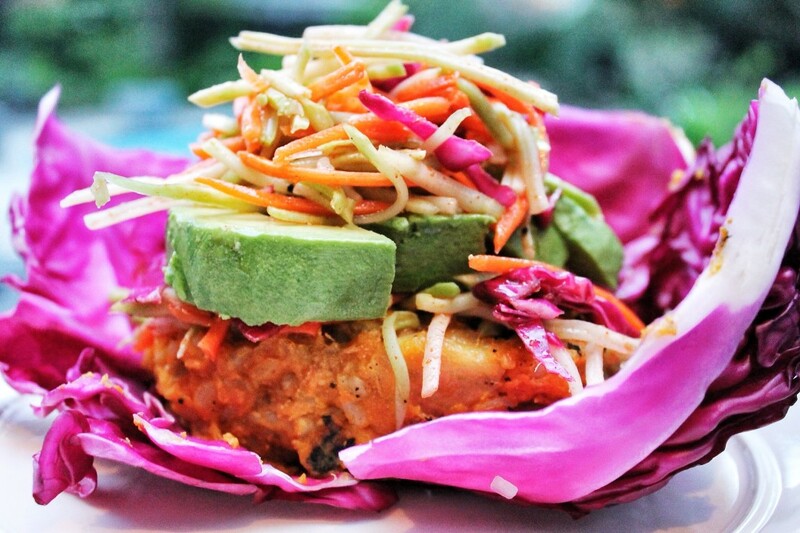 Plus, the sweet and spicy slaw is detox friendly and adds the perfect amount of heat and crunch to the wrap. Skip the mayo and add avocado or even tomato, pickles and onion. Yum! If you want the burger to be more solid, then adding more brown, chickpea or all purpose gluten free flour will do the trick! Just slowly add until you have reached the desired consistency! 1. In a large bowl whisk vinegar, honey, sriracha, lemon, salt and pepper until combined. Then slowly add olive oil. Stir in cabbage and place in the fridge until you serve. 1. Start by getting your rice cooking according to the directions on the bag. 2. While rice is cooking, begin peeling your sweet potatoes and steaming or boiling until you can easily pierce them with a fork. 3. 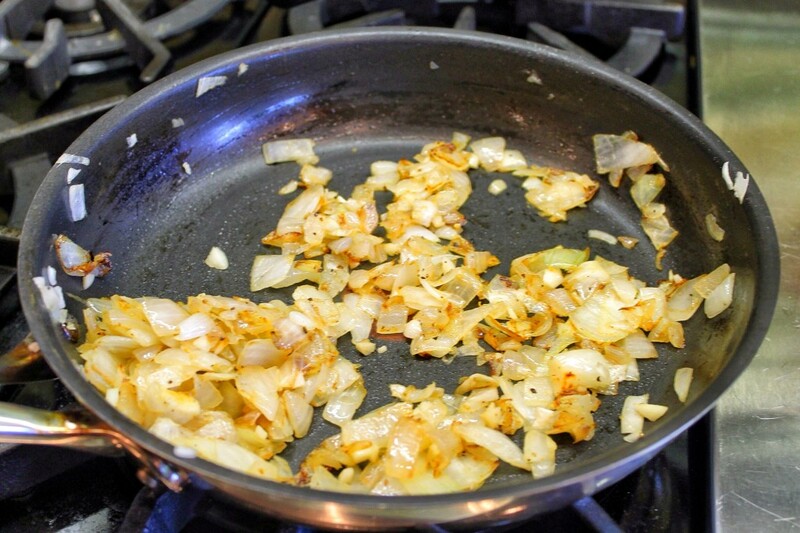 Begin sautéing onions in the 1 tbsp olive oil until tender. Add chopped garlic. Stir for 2 minutes and then put aside. 4. 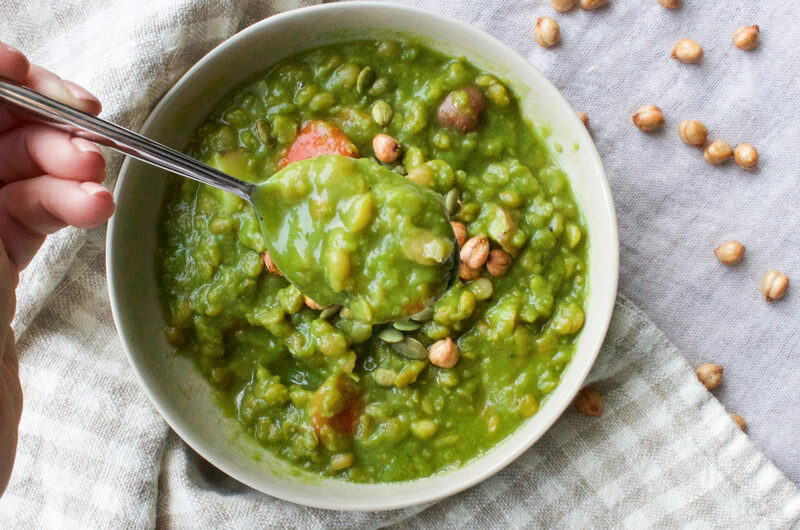 Cook lentils according to directions or drain and rinse from a can. Please wash very well! 5. 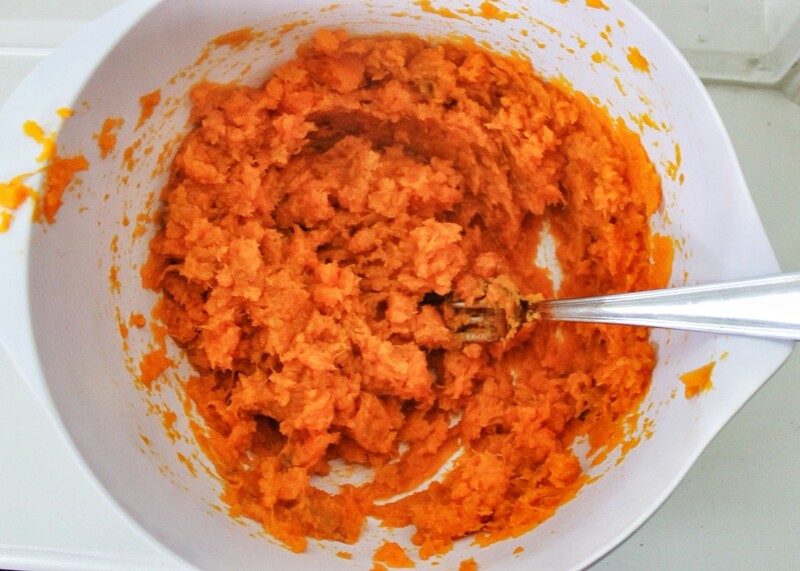 Once everything is cooked, mash the sweet potato in a bowl until smooth. Let the mixture cool. 6. Add lentils, sunflower seeds, onion/garlic mixture, and rice. Slowly add flour until you reach desired consistency. It should not be overly mushy and should hold together as a burger. Add more or less as needed. **The burger will still not be too stiff! 7. Then add the steak spice, cumin, salt, pepper and hot sauce. 8. If the mixture is still hot, it will not form well into patties. You can put it in the fridge to cool down for an hour. 9. Remove mixture and form into patties. You can put them in the fridge or freezer to use at a later date. 11. 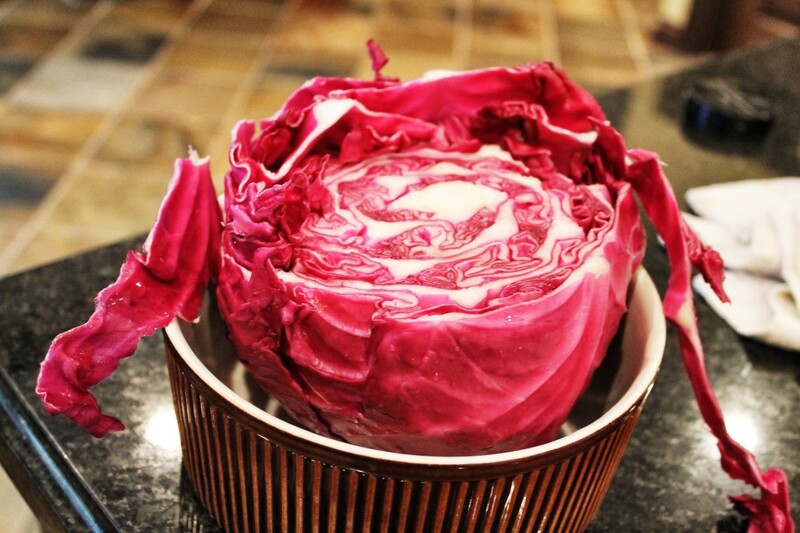 Peel the purple cabbage apart very carefully to keep their cup form. 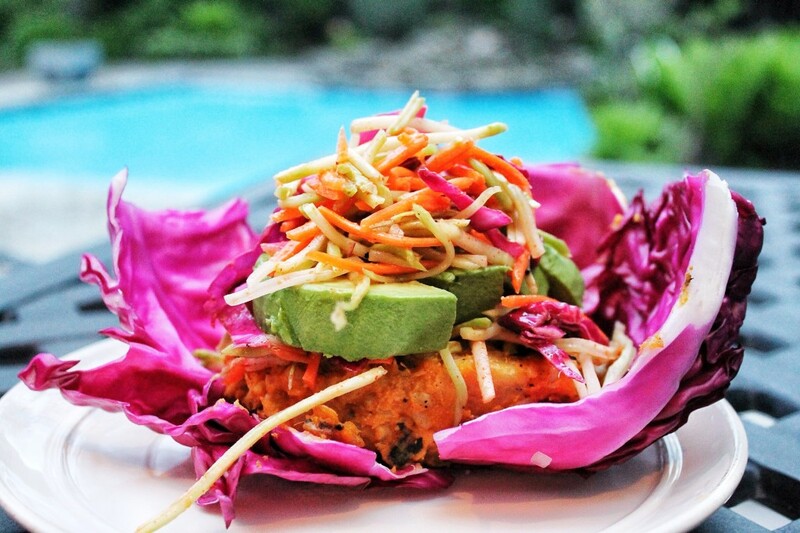 Place burgers inside the cabbage cup and top with slices of avocado and sweet n’ spicy slaw! 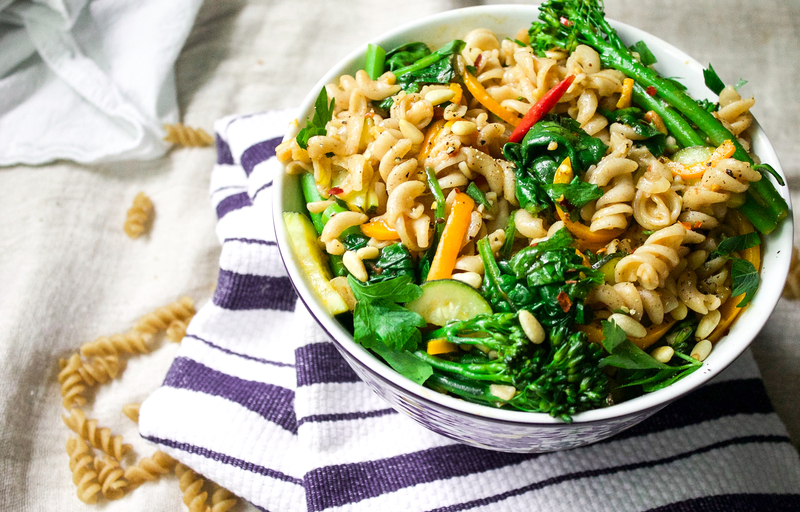 Serve with some kale chips! Bon appetit!